Daniel Udry was born in 1975. 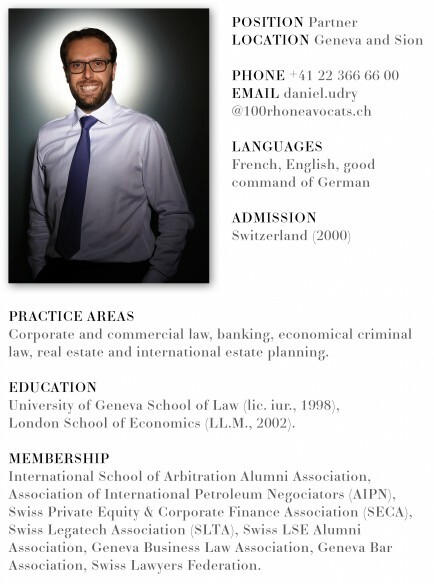 He graduated from the University of Geneva School of Law in 1998 (lic. iur.) and was called to the bar in 2000. He completed his legal traineeship (1998-2000) and worked as an associate (2001) with a Geneva based law firm specialised in civil and criminal litigation, as well as insurance law. In 2002, he acquired a specialisation in the field of corporate and commercial law at the London School of Economics, where he graduated with a Master of laws. He then joined one of the Swiss largest law firms, where he developed skills and expertise in various business law areas from 2003 to 2008. He is one of the two founders of the law firm 100 Rue du Rhône Avocats, which was launched in 2009. His main areas of practice include corporate and contract law, banking, economical criminal law, real estate as well as international estate planning. He is advising entrepreneurs, medium size companies as well as multinational groups in international transactions. He sits also on the Board of Swiss and foreign companies active in different fields, such as Oil & Gas, Fintech and Insurtech. He has contributed for Switzerland to “Statute of Limitations in International Commercial Claims”, published by Thomson Reuters (Canada) in 2016. Daniel Udry speaks fluent French, English and has a good command of German.